This book was conceived from a simple question as to why cancer is so difficult to treat. Ultimately we want to find ways to cure cancers, but that may be an elusive dream at least with the technologies we have now and expect to have in the near future. This leads the question of whether it is possible to improve current cancer treatment methods, especially from the perspective of enhancing targeted drug delivery to tumors. 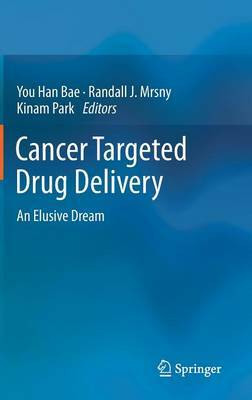 This volume is designed to provide information related to the difficulties in treating cancers through targeted drug delivery, our current understanding of cancer biology, and potential technologies that might be used to achieve enhanced drug delivery to tumors. An ideal drug delivery system for treating cancers would maximize the therapeutic efficacy with minimal side effects in clinical applications. The seemingly improved anticancer efficacy of the current nanoparticle-based formulations needs to be viewed from the context of very poor success rates for translation to human applications. The results of in vitro cell culture models and small animal in vivo experiments have not been extrapolated to clinical applications. Finding the reasons for the lack of successful translation is required if we are to discover approaches to substantially extend the survival time of cancer patients, and hopefully identify cures. Cancer Targeted Drug Delivery: Elusive Dream describes some answers of achieving the so far elusive dream of treating cancers like other chronic diseases with therapies that focus using improved drug delivery systems designed to better align with the unique biological and physiological properties of cancer.